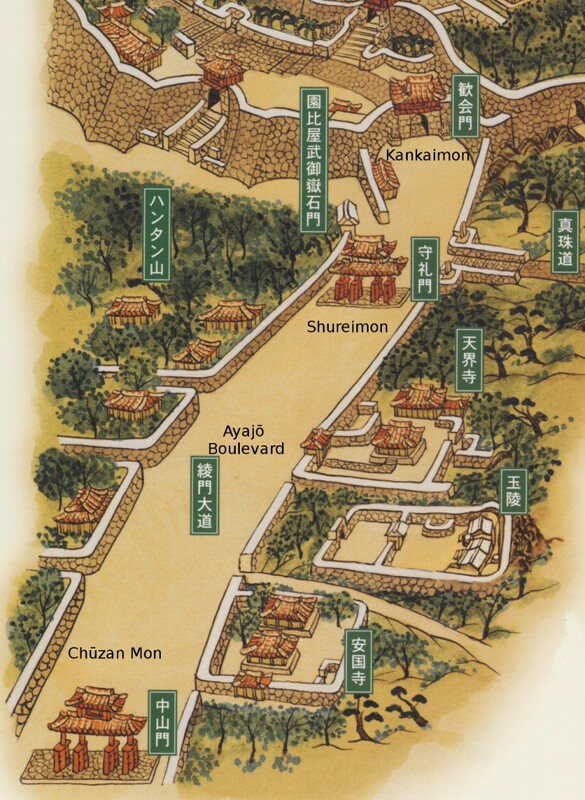 Within the construction of the Shuri castle walls there were numerous gates. 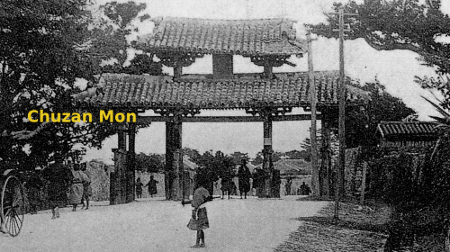 In olden times there was a gate called Chūzan-mon, which was of the same type as the Shureimon. Unfortunately, the Chūzan-mon was demolished in 1908 due to obsolescence. We know how it looked from one single old photograph only. The Chūzan Mon on the other hand was about 500m away down the road, and therefore also referred to as Shita no Ayajō, ‘lower Ayajō’. Chūzan Mon and Shureimon on Ayajō Boulevard, leading to the Kankaimon, the first gate in the actual Shuri castle walls. Ayajō Ufumichi was the primary road of the Ryukyu Kingdom, with royal townhouses and the like lined up along this street. In addition, it was also the place where large celebrations took place, like the tug-of-war called Ayajō Unna. Such a tug-of-war on the Ayajō Boulevard to place in 1898. From the reports we can see that before karate was introduced into school education, it seems to have been performed at local events. From the 13th to the 17th of August tug-of-war took place in Akabira, in Ōnaka and Tōbaru, in Yamagawa, and at the Kunigami residence in Gibo, with dozens of old people, persons in their prime, and youngsters drinking sake together. As entertainments a sword dance to a mournful melody and heroic ‘Chinese style martial arts’ were performed. Inside the gates on Ayajō Boulevard the characteristic flagpoles (hatagashira) of Gibo in form of a ancient military leader’s fan were erected. Chūzan Mon, about 500m away down the Ayajo Boulevard, and therefore also referred to as Shita no Ayajō, ‘lower Ayajō’. Shuri-gusuku Shashin de miru. Naha 2005. 4th edition. Shuri-gusuku: Yomigaeru Ryūkyū Ōkoku. Naha 2006. 6th edition. Karate 1.0, 2013 (Chapter: The First written Notes on Tōdī, and Karate). This entry was posted in Unknown Ryukyu and tagged 1898, Ayajo Boulevard, Ayajo Ufumichi, Chinese style martial arts, Chuzan Mon, Karate, KARATE 1.0, Shita no Ayajo, Shureimon, Ue no Ayajo. Bookmark the permalink.